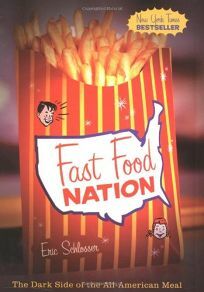 Schlosser's incisive history of the development of American fast food indicts the industry for some shocking crimes against humanity, including systematically destroying the American diet and landscape, and undermining our values and our economy. The first part of the book details the postwar ascendance of fast food from Southern California, assessing the impact on people in the West in general. The second half looks at the product itself: where it is manufactured (in a handful of enormous factories), what goes into it (chemicals, feces) and who is responsible (monopolistic corporate executives). In harrowing detail, the book explains the process of beef slaughter and confirms almost every urban myth about what in fact ""lurks between those sesame seed buns."" Given the estimate that the typical American eats three hamburgers and four orders of french fries each week, and one in eight will work for McDonald's in the course of their lives, few are exempt from the insidious impact of fast food. Throughout, Schlosser fires these and a dozen other hair-raising statistical bullets into the heart of the matter. While cataloguing assorted evils with the tenacity and sharp eye of the best investigative journalist, he uncovers a cynical, dismissive attitude to food safety in the fast food industry and widespread circumvention of the government's efforts at regulation enacted after Upton Sinclair's similarly scathing novel exposed the meat-packing industry 100 years ago. By systematically dismantling the industry's various aspects, Schlosser establishes a seminal argument for true wrongs at the core of modern America. (Jan.) Forecast: This book will find a healthy, young audience; it's notable that the Rolling Stone article on which this book was based generated more reader mail than any other piece the magazine ran in the 1990s.